Make fun animals and objects from nature’s finest materials! Collect twigs, fir cones, feathers, leaves, shells, and pebbles from your yard, park, or vacation, and create animals and objects with them. Stunning projects included are a bird nest bowl made with feathers and leaves, a nut mask and feather mask, seed pod flowers, and fir cone owls, a feathery bird bookmark, fir cone fish mobile, painted snail shells, and a twinkling night light jar. Learn about the nature around you whilst being creative. Perfect activities for parents and children to do together. Over 40 crafty makes feature a well-balanced mix of techniques, materials and colors for a range of ages. About the Author: Fiona HayesÂ has illustrated, designed and written children's books for nearly 20 years, and has worked with children and adults on a wide range of craft projects. She has always loved making things, from baking to all sorts of crafts. From her point of view, things you make are always better than anything you can buy, and best of all, creating wonderful stuff makes you and everyone else smile! 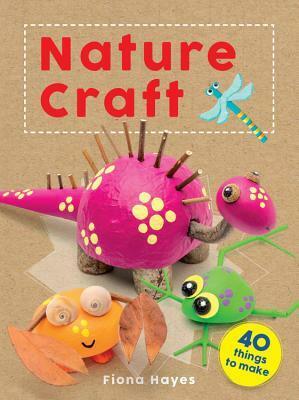 My Review: This was a great little book on crafts! I would say make sure that you use clean items though. Nothing like making a pinecone animal only to have bugs crawl out of it. So always make sure to use clean nature things. If you look online you can find ways to clean the outdoor items that you will be using. All in all this was an easy to use book that gives you and your kids a lot of aweosme and cute little crafts to create. Do I Recommend this book? Great for the whole family!